Three Different Versions in the App Store! Ballpark version allows you to enter the lineup and announce both teams during the game (if you want). Also runs in Travel Team & Wiffle Ball modes. Also run in Wiffle Ball mode. Wiffle Ball version limits each team to only having a 4 player lineup per team and is perfect for backyard use. 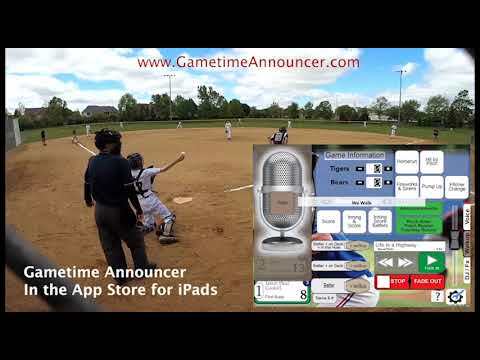 ​Gametime Announcer for iPad and iPhone! Walkup & player announce with just Drag-and-drop! To announce the next player with their walkup song, just drag “Batter with Walkup” button over to the microphone. Drop the button onto the microphone, the music plays for 3 seconds at full volume, then fades down and the player, his position and jersey are announced and the music’s volume fades back up. To play a song between innings, just drag the play button over and drop it on top of the microphone. Beautiful Background Skins Included on the Settings Page!